I've done a bit of Yeast baking in the last few months and we are becoming a li'l more comfortable with each other now,I believe.A good recipe,good quality yeast and some time on hands,bread baking is time consuming,is all you need to bake good bread.What if you have a group of friends who all try the same recipe together,what fun,right? When Aparna put up a message on facebook calling bread baking enthusiasts together for a bread baking group,I was excited.As you may know,Aparna is someone whom I adore for her baking skills.Simple,no-frill recipes and delicious,gorgeous looking breads are her forte.I knew I was in safe hands. We Knead to Bake is a group of enthusiastic bakers who,under the guidance of Aparna are planning to bake a bread a month.For January,the chosen recipe is Herb & Cheese Pull-apart Loaf.I've seen and got intimidated by similar looking breads before so I was a bit wary before I went through the recipe.But believe me when I say this one's a really easy recipe which looks as good as it tastes. 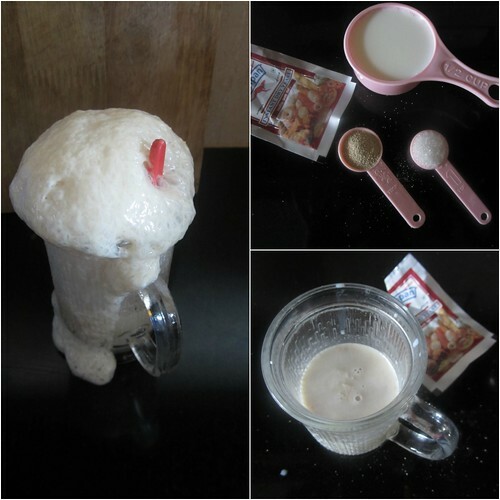 In a small bowl, dissolve the sugar and the yeast in the 1/2 cup of warm milk. Keep aside for about 5 minutes till the yeast mixture bubbles up. 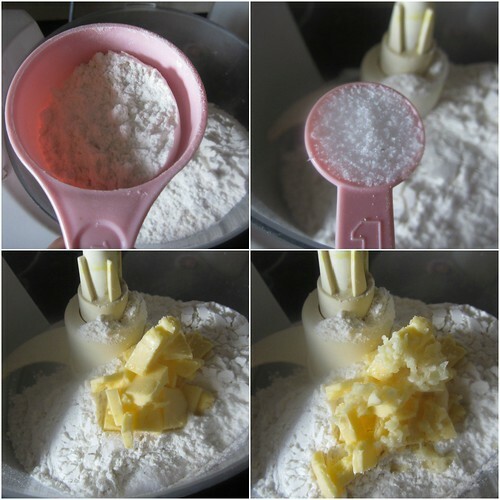 Put 2 3/4 cup of flour, salt, softened butter, and garlic paste in the food processor bowl (or a large bowl) and pulse a couple of times to mix. Then add the yeast mixture and the 3/4 cup of milk and knead till you have a soft, smooth and elastic/ pliable dough which is not sticky. Add a little extra flour if your dough is sticking, but only just as much as is necessary. 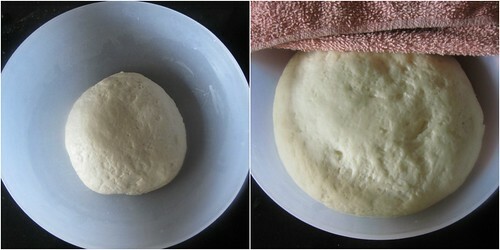 Shape the dough into a ball and place it in a well-oiled bowl, turning the dough to coat it completely with oil. Cover and let it rise for about 1 to 1 1/2 hours or until almost double in volume. Dust your work surface lightly with flour. 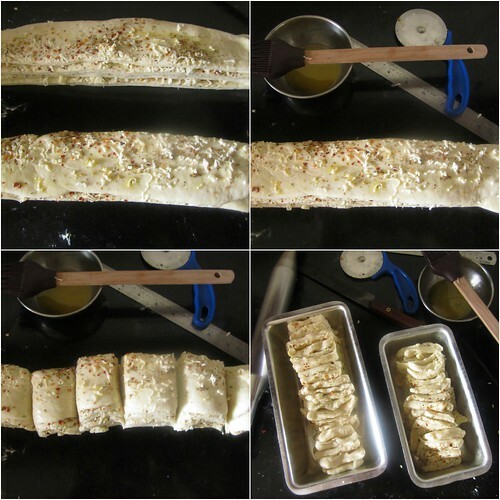 Deflate the dough, shape it into a square and roll the dough out into a larger square that is about 12’ by 12”. Brush the surface of the square with the melted butter. Evenly sprinkle the herbs, pepper/ chilli flakes and then the grated cheese. Use a rolling pin to very lightly press the topping into the dough to ensure the topping doesn’t fall off when you are stacking the strips. 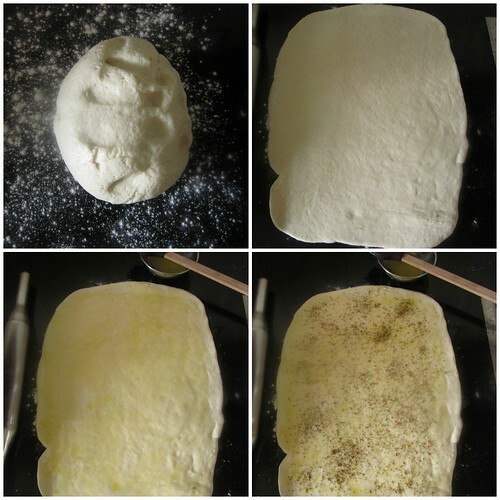 Using a pizza cutter, slice the dough from top to bottom into 6 long and even strips – they do not have to be perfect. Lay each strip on top of the next, with the topping facing upwards, until you have a stack of the strips. You can put the 2 strips cut from the sides in the middle of the stack so it looks neater. Using a pastry scraper or a sharp knife, cut straight down through the stack dividing it into 6 equal pieces (6 square stacks). Grease and lightly flour a 9” by 4” (or 5”) loaf tin.Layer the square slices, cut sides down into the loaf tin. 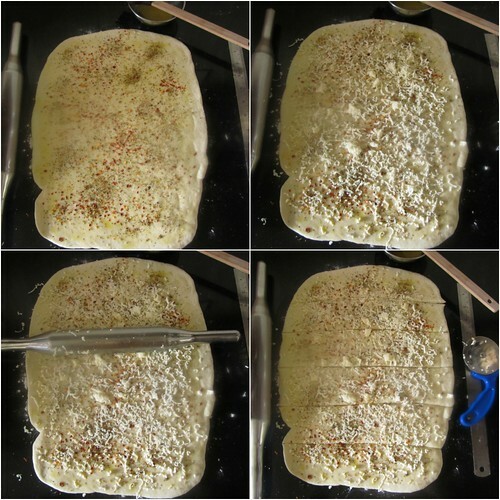 Cover the loaf tin dough with a towel and allow the dough to rise for an hour. Lightly brush some milk over the top of the loaf. Bake the dough at 180C (350F) for about 30 to 40 minutes until it is done and the top is golden brown. This recipe bakes one 9” by 5” loaf.I used two smaller sized loaf tins. The filling can be of your choice-pesto,mint or butter-garlic or even sun-dried tomato,olives,caramelized onions-choices are aplenty. This versatile bread can be made into a sweet loaf too-just add 1/4 cup of sugar to the dough and proceed with the filling.Think Cinnamon-sugar,Orange marmalade-raisins,Chocolate chips and many more! Bread looks delicious. Nice step by step pictures and explanation. Wowie Divya... This bread loaf looks so gorgeous! 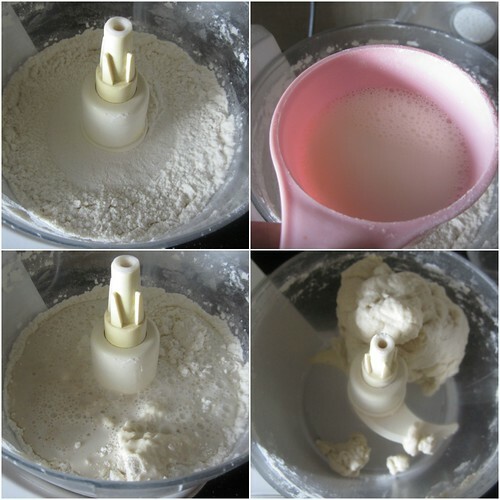 I am definitely trying this.. and also am going to be following the We Knead to Bake series post out here :) Loved it! i particularly loved your second picture....I did not have the patience to roll the dough out in such a perfect rectangle and I had some peaks and ebbs. Now I shall have to learn from all of you! Wow..perfect beautiful looking loaf and loved the filling..
Divya! Your bread looks absolutely delicious! It sure is a lot of fun baking with friends! i am terribly hungry now!!! Loved your step by step pictures. The bread is looking very delicious..!! Wow! And kudos to the step by step pics! 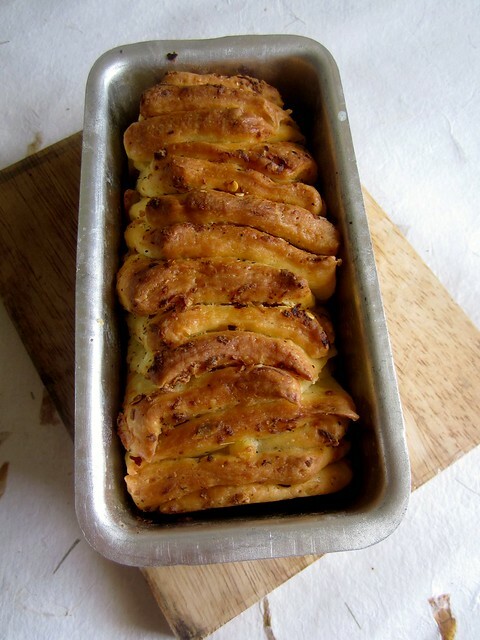 Very beautiful pull apart bread, terribly irresistible. Love the way your bread has turned out and which yeast do you use, it has proofed so much so checking. I use Mauripan Yeast sachets. Go ahead and try it Sujata.Yes you can skip the garlic and add any filling/flavoring of your choice.It is easier to knead the dough by hand would be what my amma will say-no cleaning up the food processor when you all you need is just one big bowl to knead the dough!Do try and let me know! I will join the jing bang soon!! lovely stepwise divya..sooper patience! sooper bread!! Ur yeast has bubbled up beautifully. Loved ur pull apart bread. Beautiful! I ve always feared food processors. But i think i just found some inspiration. Beautiful loaf! Love the texture of your bread....guess I can use it as pillow...its so soft. Nicely done! 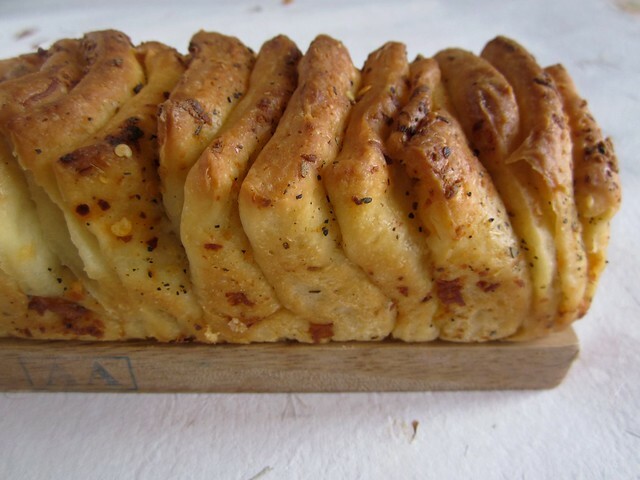 I love pull-apart bread! There's just something to it...and yours looks delectable! Also great step-by-step= instructions, makes it so easy to follow! This was lovely, Divya.. just made it last night.. yea avoided using the food processor due to sheer laziness and the bread was still awesome.. thanks for your patience in putting up the step by step demo. This is a delicious recipe. I love your all recipes and successfully tried few of them. I just want to know if this bread can be made with half all purpose flour and half whole wheat atta. Also is there any supplement for yeast with same results? Beautiful bread! !Loved the step by step presentation. Have never dared to use the processor. Do you knead completely in the processsor or transfer it to a wooden board to knead? Thanks Veena.I was wary of kneading the bread dough in the processor toobut have taken to doing it totally in it now with great results.Quick and easy-only if the recipe calls for a long knead(knead for 5 minutes or so)I do it manually. Divya! Loo inning time! Good to be baking with you again! 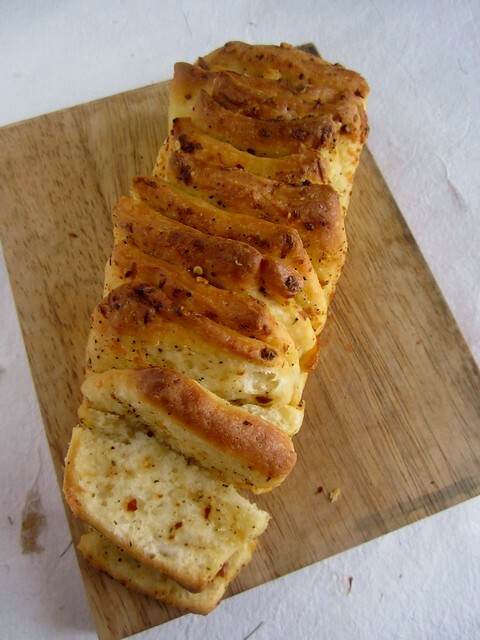 Cheese and Coriander sounds yum.Glad you liked the bread! Mm, I love a good pull-apart bread! That looks AWESOME! Delicious looking bread.. You've baked the bread in an OTG or a microwave convention oven? If OTG, then you've baked in the bake mode or in the toast mode where both the top and bottom elements are on?? 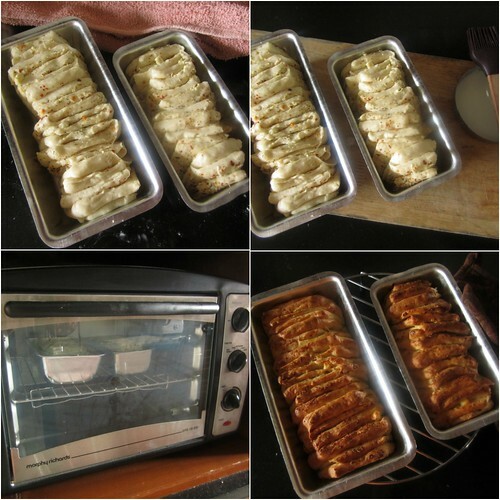 Thank you.As seen in the pictures,I baked this bread in my OTg-Morphy richards.I baked it in the bake mode with just the bottom coil on. Lovely recipe, I am new to baking and I am gonna try your recipes one by one! Quick question about this recipe, do I have to preheat the oven? Then for how long? you should preheat. if convection oven, 5 mins is enough, otherwise i guess 15 mins. so u preheat with the same temp u need for baking . Would want to try this asp.Cant wait. I tried this recipe last weekend , the taste was great but the texture was like a chewy biscuit. I followed your recipe verbatim but feel there are some places where I would have prolly gone wrong. Could you kindly help me figure out? 1)I used the yeast brand solar but it didnt bubble up at all though i waited for more than 5 mins? 2) the milk used to pour over yeast wasnt warm enough. Does it matter? 3)I dont have food processor so hand kneaded the dough, should I knead it like how it is done for rotis? If the yeast does not bubble up,it may either be inactive or the temperature of the water was too hot/too cold. The milk has to be warm enough,yes,to activate the yeast.Follow this method to make sure the liquid is just warm enough for the yeast.Dip you fingers and count until five.If you remove your fingers before that,the water is too hot and if you can keep it dipped longer,too cold. You can knead the dough using your hands,just like for rotis. I use and recommend the brand Mauripan. HI Divya!!!! We share the same first name!!! I have been reading ur recipies since few days and they all look so amazing........You show the steps alongwid photographs which is appreciable. i have a question...i don't have OTG, so can i use my microwave at convection mode for this n other bread recipes of urs? Yes you can.I use both my MW and OTG for baking. I love this bread and having just got a little comfortable with APF and yeast, was looking for a recipe for herb bread. I am happy that I found this and your step by step tutorial makes it so easy. Thankyou Divya. Will come back with the finished recipe. I tried it out! !! Was divine! Made it with gouda cheese and methi and chilli curry flakes. Thanks for the recipe! What is the shelf life of baked bread divya?can i keep it for a day or two?